This book is well known for its coverage of modern topics (Game theory, Economics of Information, and Behavioral Economics), clarity of its writing style and graphs, and integrated use of real world examples. The emphasis on relevance and application to both managerial and public-policy decision-making are focused goals of the book. This emphasis is accomplished by including MANY extended examples that cover such topics as the analysis of demand, cost, and market efficiency; the design of pricing strategies; investment and production decisions; and public policy analysis. Economists and strategists looking to stay current with economic information. Written by two of the most distinguished authors in the field, the third edition of this popular and highly acclaimed text continues to present microeconomic theory in an accessible manner. Featuring examples of business and pubic policy applications in each chapter, this text demonstrates theory at work in real companies, industry, and government to give students a more relevant and engaging treatment of microeconomics. Conveying the very latest developments in the field through lucid exposition and always with a minimum of mathematics, this text is now full-color and has numerous graphs and illustrations to make it the clearest written, most current and engaging microeconomics text available. This well-received book is a market leader in the field of Microeconomics, and demonstrates how microeconomics can be used as a tool for both managerial and public-policy decision making. Clear writing style and graphs compliment the integrated use of current, real world industry examples throughout the book. It emphasizes relevance and application to cover modern topics—such as Game Theory and economics of information—and examples—such as United States v. Microsoft, pricing cellular phone service, and Internet auctions. Coverage of other up-to-date issues includes supply and demand, cost, consumer behavior, individual and market demand, market failure, and the role of government. For individuals with an interest in economics, microeconomic theory, and price theory. 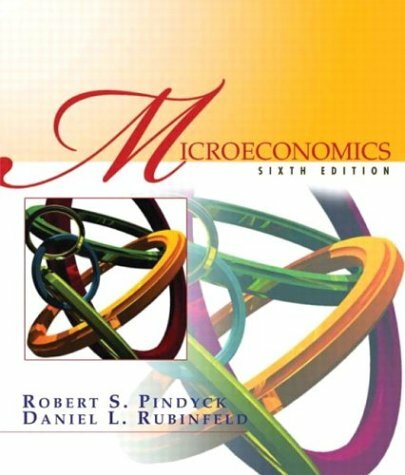 Pindyck, Robert S.; Rubinfeld, Daniel L.